A year after being demobbed from the army after the end of the Second World War, and a few months after a traumatic run-in with the Slattery gang, Douglas Brodie is working as a rookie journalist for the Glasgow Gazette. An ex-policeman and ex-soldier, Brodie has a nose for trouble. His woes start when his editor, in the absence of the established crime reporter, sends him to the scene of a murdered councillor, the chair of the planning committee for the city. Shortly after, he’s accosted by a former soldier who wants him and advocate Samantha Campbell to help his friend, who’s been arrested for breaking in to a house. They reluctantly agree, but the man is nevertheless sent to prison. Then a series of brutal attacks start to take place around the city, the victims accused of committing unpunished crimes. With the Gazette’s crime reporter poking around the death of the councillor, it’s left to Brodie to write about the vigilante attacks, but he’s soon drawn into a game of cat and mouse with the gang and other forces. 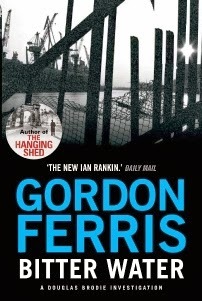 Gordon Ferris’ writing is easy on the eye and he tells a colourful tale that rattles along a fair clip, with plenty of action and twists and turns. The story is entertaining, but one has to often suspend belief for it to work, with too many elements relying on characters not pursuing the logical course, the police being hopeless, and the public to a person siding with the vigilantes. The result is a kind of mix of detective novel and action adventure. The characterisation is quite nicely done, especially Brodie and Samantha Campbell and their will-they-won’t-they relationship, though many fitted the stock character mould (the dullard inspector, the red-haired barmpot, the world weary journalist, the upper class lout, etc). The historical contextualisation is not laboured and there is a decent sense of place. Overall, an enjoyable read that keeps several threads moving along and knots them in a blockbuster conclusion.